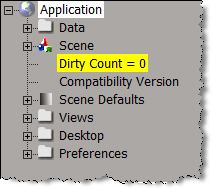 You can read more about the dirty count in the Softimage KB article Scripting – Understanding the dirty count parameter. This example JScript uses the dirty count to determine whether or not the current scene has been saved. You can go directly to the pipe here: http://pipes.yahoo.com/softimage/info. I prefer the List view myself. Note: the pipe filters the RSS feeds from the Area looking for the keyword “Softimage” and “xsi” in the title and description. This works pretty well for tutorials, tips, and plugins, but not so well for scripts. Most of the scripts posted on the Area don’t use the words “Softimage” or “xsi” in either the title or description. Here’s a video walkthrough of installing Softimage 2010 SP1. In this video, I take a look at the Random Value node and show a basic technique for learning how ICE works (how to use attributes and Show Values to help visualize what’s going on). You can use the Edit styles defined in WinUser.h with siUIStyle to get a password-entry text box. The ES_PASSWORD style displays all characters typed by the user as asterisks (*). On the XSI list, see the thread PPG with star password input? A colleague wanted to use Polygon Reduction on a heavy face mesh, but he didn’t want to apply the Polygon Reduction op with the default 50% Ratio. So he asked me how to change the default values in the Polygon Reduction ppg. Default values in spdls are never used except for shaders. In the case of shaders, these default values are used when creating a preset with spdl2preset. For all other types of objects the default value is never even looked at. Softimage developpers have often mistakenly put a “default=” in spdls even though this value is ignored. The default values for comes from the preset file. To change them, save the preset of the property page on top of the preset file used to create that primitive. These presets are found in the DSPreset folder of the XSi installation. However be aware that this may affect the result of scripts that create these primitives. So it’s best not to change them, and instead write a script that changes the values to what you want. It’s documented in the SDK guide, but not in the User’s guide, so you may not know that the script editor supports bookmarks. You can use Ctrl+F2 to set bookmarks in the script editor, and F2 and Shift+F2 to go to the next/previous bookmark. Ctrl+Shift+F2 clears all bookmarks. You can use Set Data to write ICE attribute values to custom parameters (and Get Data to go the other way). 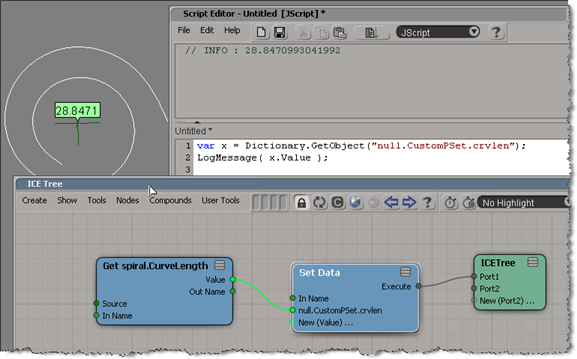 For example, you can use ICE to get the length of a curve and then store the length in a custom parameter. Note: This didn’t work when I used the name “curve_length” for my custom parameter. The custom parameter value never changed. The google group XSI Mailing List Archive goes back to about 12 June 2007. For older posts, you can go to the Softimage User’s site.